Syringomas are harmless sweat duct cysts. 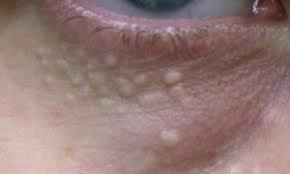 They are most often found in clusters on the eyelids but they may also arise elsewhere on the face, in the armpits, umbilicus and upper chest . Eruptive syringomas appear abruptly in adult life, as a crop of multiple lesions typically on the chest or lower abdomen.